MiniArt is a model company based in the Ukraine. This kit comes in a shrink-wrapped end opening type box. I am no fan of this type of box. Parts, decals or PE frets will find their way past the end flaps to become lost. Give me a tray and lid type box any day. 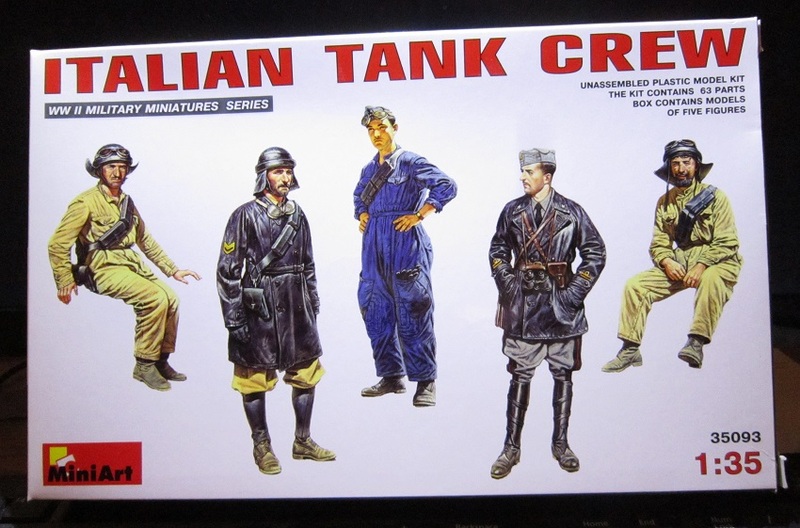 The box art shows the 5 Italian crew figures posed against an all-white background. Very much like Tamiya does their box arts. Two figures are seated and dressed the same in tan overalls with black leather Italian tanker’s helmet with ear flaps. Goggles are on both the helmets and both guys have ammo bandoliers across their chests. They each wear low shoes. The next figure is standing. He wears a black leather Italian tanker’s helmet with the ear flaps and a black leather overcoat. His pants are tan and bloused into putties over low shoes. He has a pair of goggles slung around his neck. He also has a ammo bandolier across his chest and a pistol holster on his belt and is wearing black leather gloves. The next figure is also standing. He wears navy blue overalls, low shoes, the bandolier across his chest also. He wears a grey side cap on his head with a pair of goggles slung on the front of it. He stands with his hands on his hips. The fifth, and last figure, is standing. He appears to be an officer. He has a grey side cap on his head, a tan shirt with black necktie, a short black leather jacket, a pistol holster on his belt, a pair of binoculars slung around his neck, grey jodpher pants bloused into black jack boots. One side panel has 2 small color box arts of other figure kits that MiniArt makes. One is of a 5 man U.S. tank crew (kit no,. 35126) and the other is of a 5 man French tank crew (kit no, 35105). This is followed by the statement that the kit is not suitable for children under 3 due to sharp parts, in multiple languages including English. It is intended for modelers over the age of 14. The copyright date of the kit is given as 2011. MiniArt’s street address in the Ukraine is provided, along with their E-mail address. The kit was made in the Ukraine. The other side panel has kit information in Ukrainian, Russian and English. The warning about kids under 3 is repeated and that the kit is for 14 year olds and older. The kit contains 63 parts. Paint and glue are not included and MADE IN THE UKRAINE again. These statements are marked with color illustrations of the flags of the countries that speak the 3 languages. The back of the box has full color assembly and painting instructions. 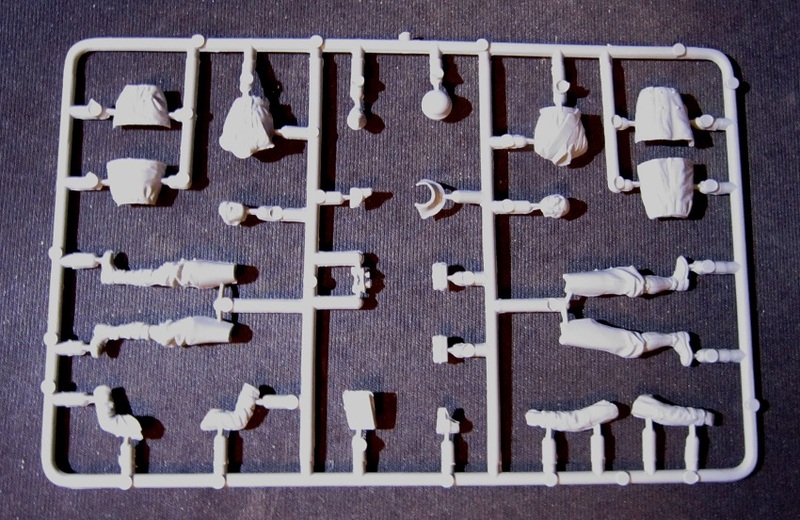 Below them is a listing of Vallejo, Testor, Tamiya, Humbrol, Revell and Mr. Color brands of hobby paints suggested to use to finish the figures. The kit contains 2 grey parts trees in a sealed cello bag. These take up just half of the length of the box. The box is way too blousy that way. I was really disappointed to see how little is in this kit for the $19.00 price. Way over priced by my opinion!! There is a small slip of paper with parts trees illustrations on it. One grey tree holds the parts of the 2 seated figures. They are divided into separate head, torso, legs and arms. They each have a pistol holster, black leather tanker’s helmets with separate ear flaps, ammo pouch bandoliers , goggles and rolled collars. I feel that this kit should not have cost much more than 12 bucks for what you get. However, the detail is decent. Some rifles, machine guns or Italian field gear in the kit would have better justified the high price. Otherwise recommended. I bought my kit at my local hobby shop.